Hello again today, friends! 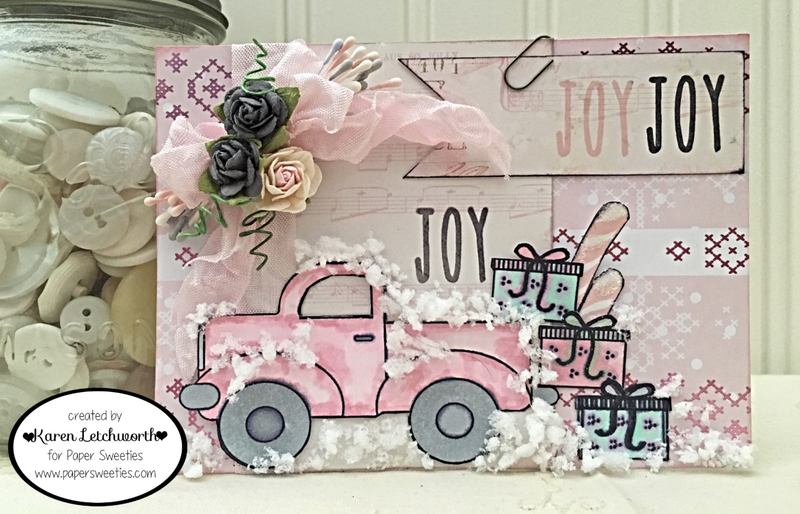 Thanks for joining me as I share yet another fun card I made using some of my favorite products from Paper Sweeties. I hope you've been inspired the past few days by all the darling projects shared by my talented teammates. If you missed anything, you can catch all the details on the Paper Sweeties Blog. 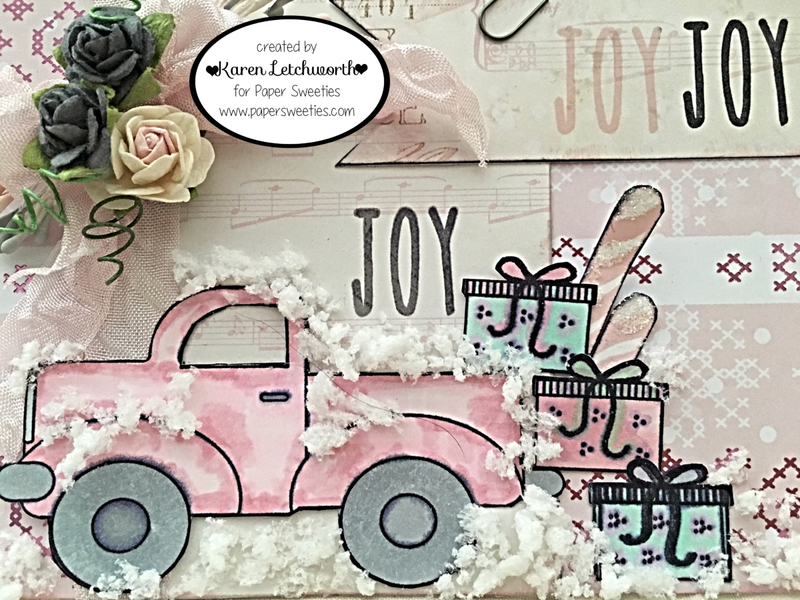 My teammates and I have been sharing some super sweet Winter projects this month combining a few of the newest Paper Sweeties products as well as a few of all our favorites. I've been having SO much fun creating with these sweet stamp set, sweet cuts and products because Paper Sweeties carries the most adorable stuff ever! 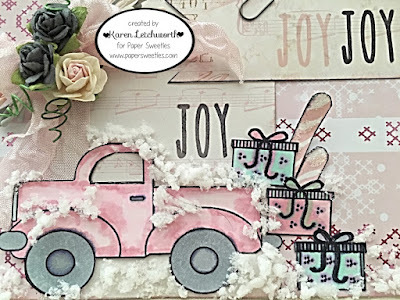 This card uses some more of that soft pink and soft mint green patterned paper from Prima. This print also has some rose gold accents in the hearts. It's so soft and sweet, and I can always find the perfect Seam Binding at Paper Sweeties to match just about any line I'm working with. For this card, I used some yummy Bubblegum Seam Binding along with some double-head stamens and open roses. I stamped the awesome pick-up truck found in the Merry Christmas Y'all Stamp Set, and I colored it pink with my Copics. I knew that I wanted to fill up the back of the truck with something.....but what? So, I figured I'd fill it with lots of snow and some gifts, candy, etc. to deliver to friends. The sentiment I chose (JOY) is from the Merry Stamp Set. I stamped it in Coal, Fog and Ballerina Pink. The gifts/packages were stamped using an image found in the Wishing You Stamp Set, and the candy sticks can be found in the delightful Homemade With Love Stamp Set. Have I mentioned how much I LOVE Paper Sweeties? Oh my friends, these are the sweetest products and SO much fun to create with. Here's the list of all my Paper Sweeties Teammates who have created a sweet Winter project to inspire you. By clicking on the names below, you will be taken directly to that blog to see that person's creativity. Thanks again for visiting me, too. I really appreciate it. Simon Says Stamp Monday Challenge - Simon Says "Recycle Something" - I used some styrofoam packaging to create my "snow". Christmas Cards All Year 'Round - Let It Snow- I used some styrofoam to create all my "snow". 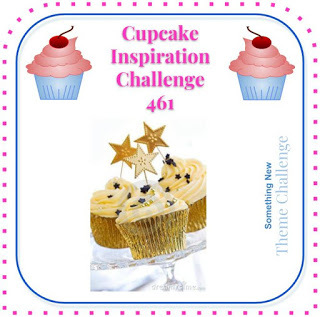 Cupcake Inspirations - Something New Challenge #461 - I used some new patterned papers, and a new stamp/die set, and my new Copics on this card. This is so cute, Karen. I love that truck, and it's super sweet colored in pink. Such a fun card. A lovely card - thank you for sharing at Christmas Crafts All Year Round. So pretty! LOVE the snow! This is just so festive with all those cute packages! So glad you shared with us at Cupcake Inspirations! Beautiful! Love the snow!!!! Thanks so much for participating in our CHRISTMAS CRAFTS ALL YEAR ‘ROUND challenge. Hope you participate in our next challenge!! Have a happy crafty day!!! That is such a sweet card!! I love it!